We install solar panels generally mounted on the roof of a customer’s home. Some mount flush with the roof, resembling discreet skylights, or attach to an existing roof surface. In a variety of configurations, solar thermal panels usually mount portrait or landscape in pairs, with the exact location, system design, collector orientation and collector size determining how much energy can be provided for your individual domestic hot water needs. We recommend leading MCS approved manufacturers’ vacuum tube panels or flat plate collectors. 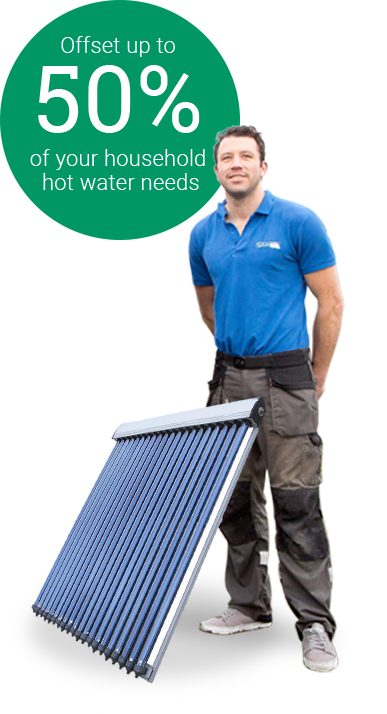 There are government funding initiatives, like the Renewable Heat Incentive (RHI) to help with the cost of Solar thermal installations. For up to date information simply visit www.energysavingtrust.org.uk.